Why it is important to use testimonial widget for business? You have your brand new website?! You are excited about your new business, your product or service?! You realize importance of your customers and your interactions with them. By now, if your read our previous posts you also know how important are customer reviews. How you can benefit from having them on many levels. Today we will take another step and write about tools that can help. One such tool is a testimonial widget for business website. As we said, by now you know all benefits of reviews. You know they are important to your potential customers. They help you improve your actual product and service. But not only that. User reviews are a free content to your website that helps you with your SEO strategy. Sort of a free advertisement for Google. If they are that important than you do wish to use a proper tool to manage them. Imagine yourself in a shop, where you would like to leave your opinion. Would you prefer as a client to be handed a book - created with that sole purpose in mind - where you can write your thoughts, a pen and a comfortable place to write it or… ripped out piece of paper and that is it? There is also another side to this. You, as a business owner, want to make sure that you do have control over what is written about you. Such place where you can - in a way - sit face to face with your customer to sort out problem if necessary. At the same time you can’t spend all your time on just that. We know that running a company is most often 24/7 job. So here is your choice. You can use an ordinary, general purpose widget or something that is specifically designed with reviews in mind - Wiremo - testimonial widget for business. There is a good chance that on your phone, tablet or PC you use specific widgets for specific tasks. After all checking out weather on your calendar works only to a certain point. It is the same with widgets for websites. Wiremo - testimonial widget for business will give you the freedom. It is light, fast and modern. You can adjust Wiremo the way you need and want so that it fits your website in a perfect way, in unison. Doing so is fast and easy, we know you can’t waste time on things like that. All the information you need from your customers, including statistics will be just few clicks away. 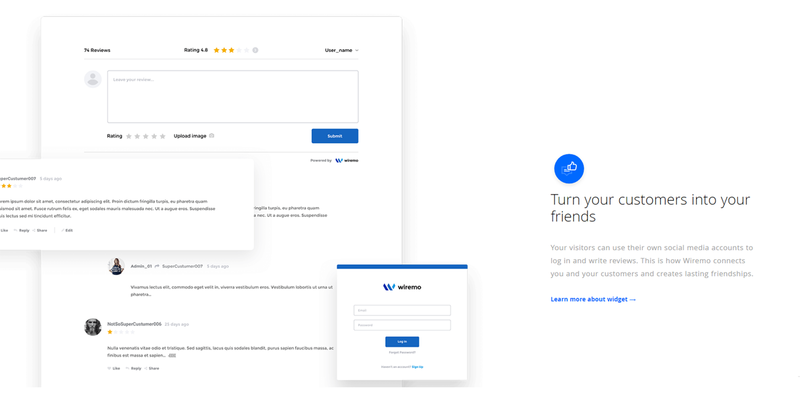 If needed, our Wiremo widget will give you all the options to interact with your customer if you’ll wish to improve his experience with your company and service. Finally it will be clear and easy to use for your customers. Not only they will be able to let you know what they think about your product. With just a quick glimpse they will know what others think and how you interact with them. As with any other thing in life it is important to have the right tool for the job if you want to succeed. Wiremo testimonial widget for business was designed and created from ground up with reviews in mind. This is the tool you need. To see Wiremo in action sing up for free and start using it.